The Angriest: Star Trek: The Next Generation: "Encounter at Farpoint"
Star Trek: The Next Generation: "Encounter at Farpoint"
Nostalgia has taken hold, and this past week I've found myself rocketing through an episode-by-episode rewatching of Star Trek: The Next Generation's first season. I remember first hearing about it, and how excited I was when this 90-minute pilot episode turned up at my local video library. In 1987 Star Trek was very much a movie franchise, with the most recent instalment - The Voyage Home - the most successful film so far. It was the perfect time to bring the franchise back to television where it began, and in a not-unexpected move they set the new series a few decades (seven of them it turns out) into the future. The Voyage Home had introduced a second Enterprise, its registry code NCC-1701A. 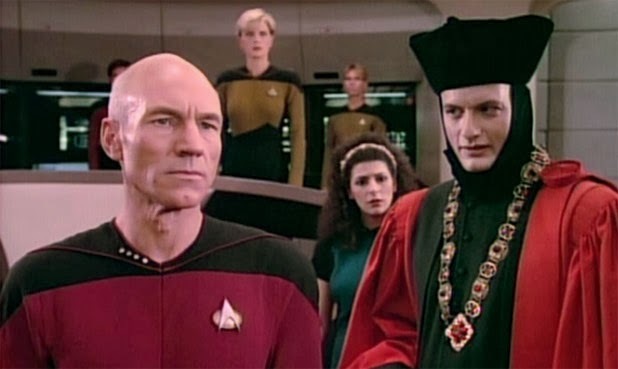 The Next Generation was to focus on the Enterprise-D, captained by the French Jean-Luc Picard and dispatched on a whole new set of missions into the galaxy. It's not a very common piece of knowledge for some reason, but Star Trek creator Gene Roddenberry was Paramount's third choice for executive producer on The Next Generation. Before he was offered the job it had already been turned down by Harve Bennett and Leonard Nimoy, both of whom were convinced a new cast and series was pure folly. On 28 September 1987 series pilot "Encounter at Farpoint" premiered in US syndication. A little over 26 years later, I've given it a fresh viewing... and it isn't very good. The characterisation is mostly all over the place. Patrick Stewart plays Captain Picard in an uncertain and stiff manner. He will do wonders with the characters in subsequent years, but in the pilot it seems like he's still not certain he wants to be in the series at all. Other characters, such as Levar Burton's Lieutenant La Forge, Marina Sirtis' Counselor Troi and Denise Crosby's Lieutenant Yar, are similarly awkward at the outset. Brent Spiner nails his character, the android Lieutenant Commander Data, from the get-go, but he's saddled with some pretty awful dialogue. Wil Wheaton, who demonstrated in Stand by Me to be one of America's best child actors, is saddled with some awful dialogue - it's as if the writers went out of their way to get the audience off-side from the beginning. It's not a surprise that Wesley turned out to be such an unpopular character. For Wheaton it must have been infuriating. I was very surprised to discover that the best performance in the pilot belongs to Jonathan Frakes as Enterprise first officer William T. Riker. He's funny, warm, bold and direct, and pretty much lands fully-formed on the screen. The other characters will take weeks to finally settle in and for the actors and writers to get a handle on their characters. Frakes manages it from the beginning. I suspect he has an unfair advantage: of all the Next Generation characters, it's Riker who feels the most like a character from the original Star Trek. This is the first episode, and introduces the cast, so it's basically a necessary episode to watch if you're going to watch the series. Oh my goodness though, it's a poor piece of work. 'Nil points', as Picard's home country would say. I've started my FIRST watching of ST:TNG recently and it's really amazing to watch how terrible it all is so far! I know what we had before hand was even worse, but I think people forget how far we have come in storytelling techniques these days.